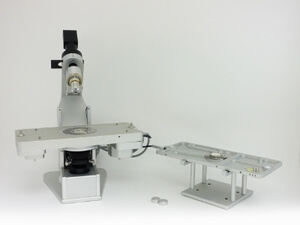 The Linkam Optical Shearing System (CSS450) allows structural dynamics of complex fluids to be directly observed via standard optical microscope while they are under precisely controlled temperature and various shear modes. Using the optical shearing cell, it is possible to study the microstructure evolution of complex fluids in great details for many physical processes, e.g. coarsening of binary fluids during their phase separations, flow-induced mixing and demixing of polymer blends, defects dynamics of liquid crystals, aggregation of red blood cells and their deformation in flows etc. We are then in a good position to correlate micro structural dynamics with rheological data for gaining insight into rheology of complex fluids. Micro-stepped stepper motor allows 25,000 steps per rev.